Looking like a cross between an eel and a long-beaked bird, the garfish arguably offers the nearest to game fishing you can get off the coast of Britain – a strong fighter that will often leap clean out of the water and battle the angler for every inch of line. This tenacity and penchant for aerial acrobatics once hooked has led some to liken it to catching marlin – though obviously at less than a thousandth of its weight and only about a fifth of its length, the tackle needs to be a good bit smaller! 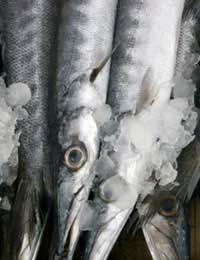 Surprisingly, few anglers set out to catch garfish, making it probably one of the most overlooked and under-appreciated of sea fish species, which is a great shame particularly since there’s a variety of ways to catch it and it makes very good eating – if you don’t mind its green bones! The garfish is a summer visitor to our waters, especially to the southern and western coasts where it can routinely be found in quite large numbers, although our changing climate seems to be encouraging many more of them to move further north during the season. In a typical year they arrive in May or June, disappearing again for warmer waters around the end of September. They are surface fish, seldom encountered deeper than 30ft or so and more typically within three of four feet of water – fast predators always on the lookout for food, which is, of course, good news for the angler. Almost any stretch of water that holds the smaller fish they eat is likely to prove a fruitful place to try. Often found in the company of mackerel around jetties and piers, garfish can also be taken from the shore, alongside rocky outcrops and harbour walls as well as offering a real “game fish” experience from a boat. The garfish can be caught using any technique which presents a suitable bait to this swift little torpedo of a predator, though the most popular approaches seem to be by float or spinner. Light tackle is called for – around 4lbs line will be adequate for a fish which seldom weighs in at more than a couple of pounds itself – and either a stick-type float or a fairly small spinner of no more than 20 grams. For the float angler, an inch strip of mackerel, herring or even garfish (they have somewhat cannibalistic tendencies) suspended a few feet below a light quill should bring results, though it may be necessary to adjust the setting until you find where your quarry are lurking. Suitably sized small whole fish, lug or rag worms, and prawns can also be used successfully. The name of this game is lightness, so only use enough weight to keep the bait at the desired depth – and out of the beaks of marauding gulls! If you’re intending to go spinning for garfish, most people seem to agree that silver is the best main colour – perhaps with a bit of red to give it extra impact – and the flashier the better.The smaller varieties of revolving spoon spinners generally make a good choice, but the main trick to catching garfish, whatever kind of spinner you favour, is to go for a fairly fast wind, keeping your lure in the upper reaches of the water. As a general rule, garfish find a good show of surface splashing irresistible, but if they’re proving a bit hesitant, try varying the speed, allowing the spinner to dive slowly for a brief while, before resuming a fast retrieve and so on, to mimic the easy meal offered by an injured fish. On days when they simply aren’t otherwise biting, this often proves to be just too much of a temptation to miss. However you fish for them, make sure you’ve got your net in the water in plenty of time; although these game little fish fight all the way in, they reserve their strongest efforts for the surface. Many are the hooks that have been dislodged from their hard beaks at the last, with a quick somersault or a vigorous shake of the head. There are undoubtedly very much larger fish in British waters, but few of them measure up to this one for sheer exhilaration on a pound-for-pound basis, or for the ease with which you can go fishing for it. Whether you’re a regular and experienced angler looking for something a bit different, or an occasional seaside visitor, it’s well worth spending a summer’s day or two in quest of the feisty garfish.